Warchild can be seen as Jethro Tull going back to basics. After releasing Thick as a Brick and A Passion Play, two ambitiously-arranged concept albums that consisted of one extended, suite-length piece each, Warchild marked a return to separate songs. It didn’t depart drastically from the previous records as it was still a hybrid of progressive rock, Elizabethan folk, blues, and even a bit of jazz (leader Ian Anderson’s sax playing was certainly prominent on Warchild as was his trademark flute). The record is best known today for containing two of Tull’s popular songs, “Skating Away on the Thin Ice of New Day” and the bouncy “Bungle in the Jungle” – but that’s to slight other highlights form the record, including the title track, the folk-meets-greaser rock in “Ladies,” and the hard-charging “Sealion” and the heavy folk rock of “Two Fingers.” Originally Warchild was conceived around the same time the band was planing to do a film (whose theme was on the afterlife) and a soundtrack record – both of which never came to fruition. 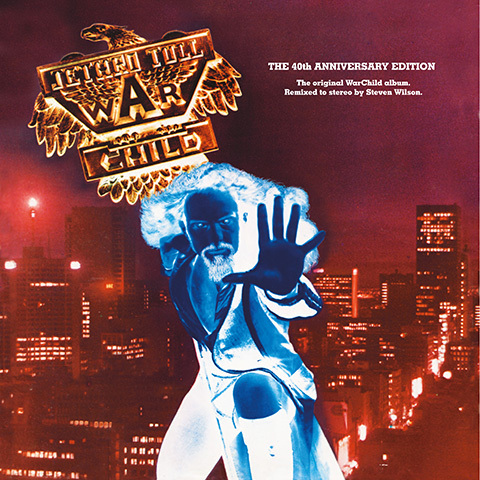 However, this new deluxe 2 CD/2DVD version of Warchild for its 40th anniversary (which features the original album remixed in 5.1. surround sound by Steve Wilson) unearths the orchestral tracks for that project as well as additional songs recorded from the period, including “Glory Row,” “Warchild II,” and “Paradise Steakhouse”; plus film footage of a press conference in Switzerland announcing the Warchild project. The 80-page booklet is overwhelming with an extensive history surrounding the making of the album along with photographs, excerpts of the film script synopsis, and even interviews with the touring members of the string section! The previous 2002 reissue of Warchild offered a few bonus of tracks, but this now comprehensive set surpasses that 10 times more, telling the complete story what might have been had the film/soundtrack had proceeded. Like the recent deluxe reissues, this set of Warchild is an exhaustive document of Tull’s dominant period.